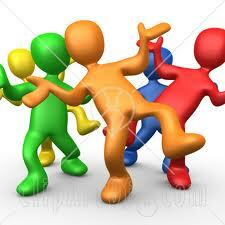 This is another edition of Friday Dance Party on Acorns On Glen. It’s the time where we give thanks for making it through another week and for being alive and present here on Earth. How do we celebrate another week of living? We dance. So, are you alive this Friday? Are you and your family safe and sound? Take a few seconds now to be in the moment and realize what a great life you truly have. Did you give thanks for that? So it seems that most of the children that are a part of our life are back in school now for the start of another academic year. When I was (much) younger, I always liked the start of school. While summer vacation was great, my friends and I eventually grew to miss the structure and extra-curricular activities that school had to offer. Right before the start of school, my mom would take my brother and I to buy a few school clothes, which were jeans, shirts, shoes and sneakers and maybe a pair of dress slacks. I can still remember going to Sears department store in Iowa and walking up and down the aisle of boy’s clothes several times to make sure I got the best that Sears had to offer. I didn’t want to make any mistakes. We also went and bought school supplies…lots of pencils, paper, erasers, pens. I think that is where the similarities to today’s back to school preparations end. Kids today seem to be a lot smarter in almost all area than what we were. More stylish with the school clothes, more technologically advanced with the supplies and just smarter in terms of everyday life. Maybe it’s better schools, the internet…many of the kids we know get homework to do over the Summer and even use computers now versus carrying around textbooks. So enjoy this week’s dance number…a slow ballad by Plugin Stereo featuring Cady Groves, a great example of extremely young, but smart, kids singing a simple little song about young love. Turn your speakers up and have fun with this song. You’ve made it through another week and many of you should be proud that you got your kids back to school safe and sound. Go ahead and do a little dancing. You deserve it. What did you have to do to get your kids ready to go back to school? This is Spirea ‘Blue Mist’ that protects our front door from the front yard. It is another one of the plants that bloom here on Glen Road in September. 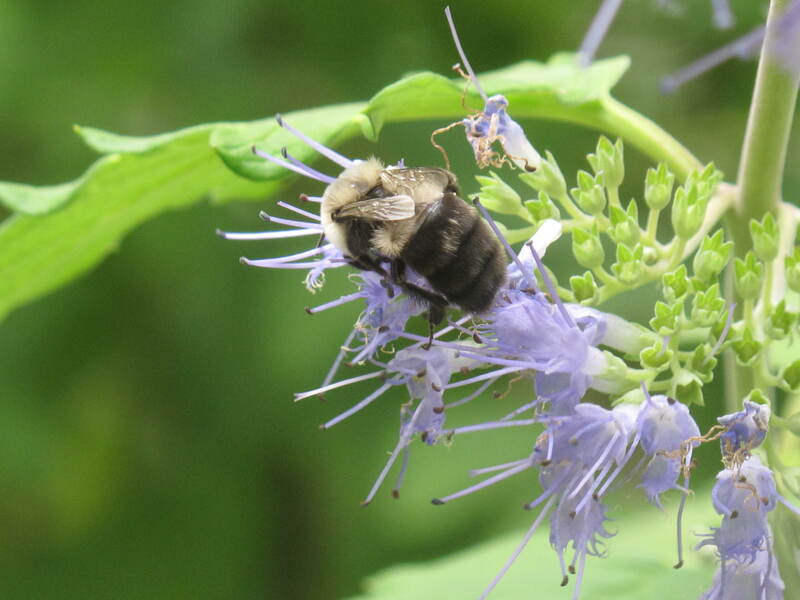 When the blue flowers show their pretty faces, you will soon have every bee within a small radius of the house coming over to visit to collect some special end-of-the-season pollen and nectar. The bees are so intent on collecting pollen and nectar that you can stand right next to the tree and they don’t care. They don’t fly at you or swarm at you. All the bees are intent on doing is collecting pollen and nectar and then going back to the hive to make preparations for the Winter. Sometimes when there is no wind and you listen very closely, it almost sounds as if the Spirea is actually buzzing. Our Spirea ‘Blue Mist’ is quite a grower. By the time we hit September bloom time, the bush is over four feet high and about as many feet wide. No matter how small I trim it down in the Winter and Spring, this Spirea always has a growth spurt in August as if to do so to show itself off to all the bees in the neighborhood. At the start of the Spring, our Spirea ‘Blue Mist’ was pruned down to one foot tall and one foot wide. That is some fast growing in a few short months to get to four feet and it does this in some of the hottest months of the year. 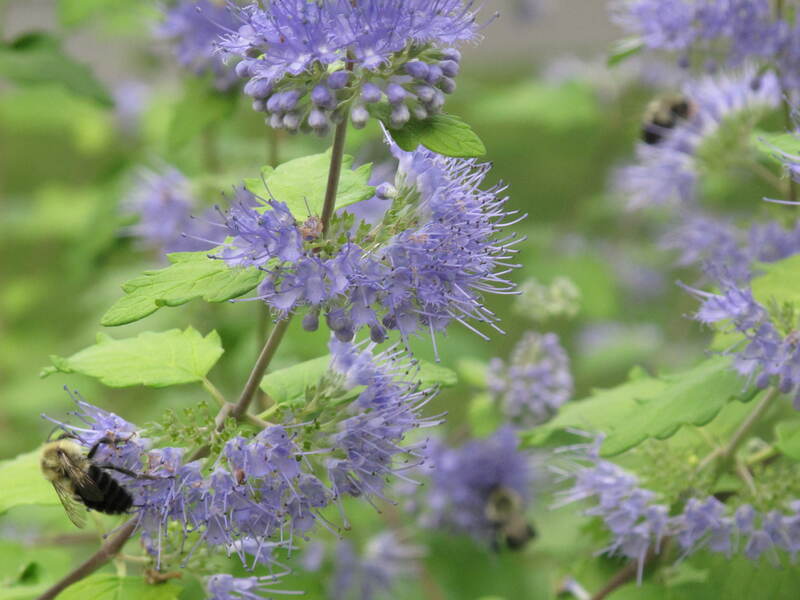 Caryopteris’s (the botanical name for Spirea ‘Blue Mist’) low mounding habit makes it perfect as a border plant for massing purposes and works wonders in dry, sunny spots. There are blue foot-long flower spikes that cover this plant in September and this make for quite a visual display. 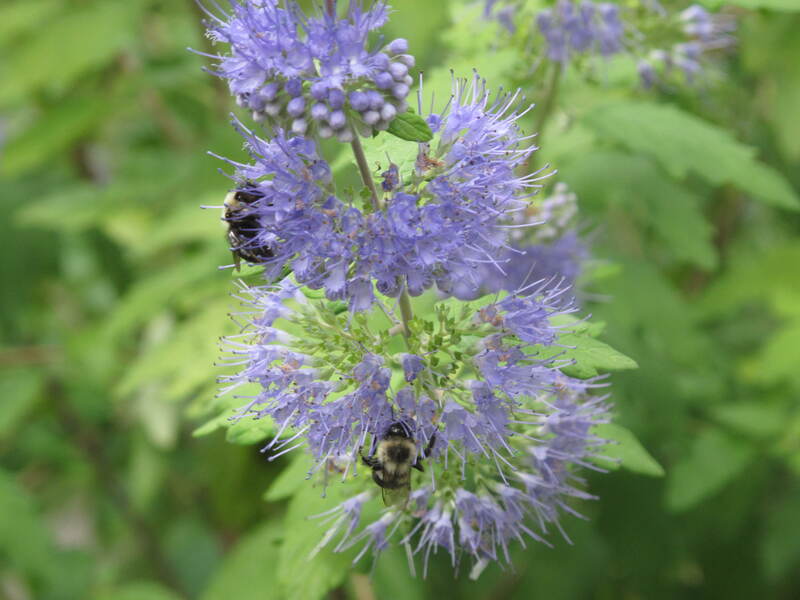 Spirea ‘Blue Mist’ is also many times referred to as a Bluebeard, which is not too difficult to understand where this name comes from due to the look of the blooms. The first group that walks past the Spirea that is filled with bees and they don’t notice a thing. The last group are those people who notice the bush filled with bees and become terrified and take off running to our front door screaming and yelling for us to open up as soon as possible! Since no one has ever gotten stung by one of the Spirea bees, we always laugh at those terrified individuals that are part of group 3. We know it is not right, but we can’t help it. We apologize to those folks in advance. So if you are interested in a late-blooming bush for your garden that can also add some comedy to your every day life, give Spirea ‘Blue Mist’ a shot. Trust us, the neighborhood will be….buzzing. What late season bloomers do you have in your garden? This is a tangled and twisted reminder that all of the clean up work from Hurricane Irene is not completed yet here in Connecticut. 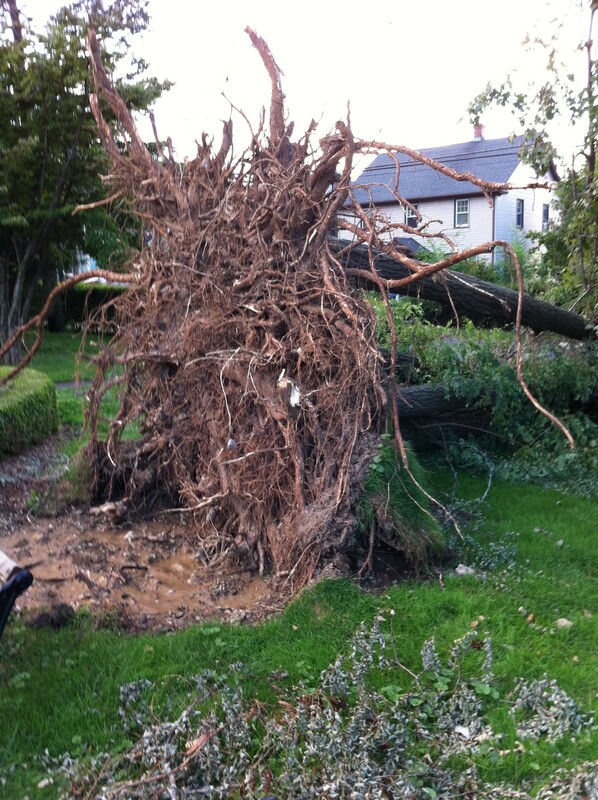 This tree looks like it was pulled like a weed out of the garden….roots and all….and then tossed aside to wilt and die. Maybe this is Medusa’s head with snakes growing from all sides? Little by little, trees like this are getting cleared away in our community. In time, the effects of the hurricane will be just a distant memory. What does this mass of tree roots look like to you? This is a Sedum ‘Autumn Joy’ and my sure-fire way of detecting Autumn’s presence among us. 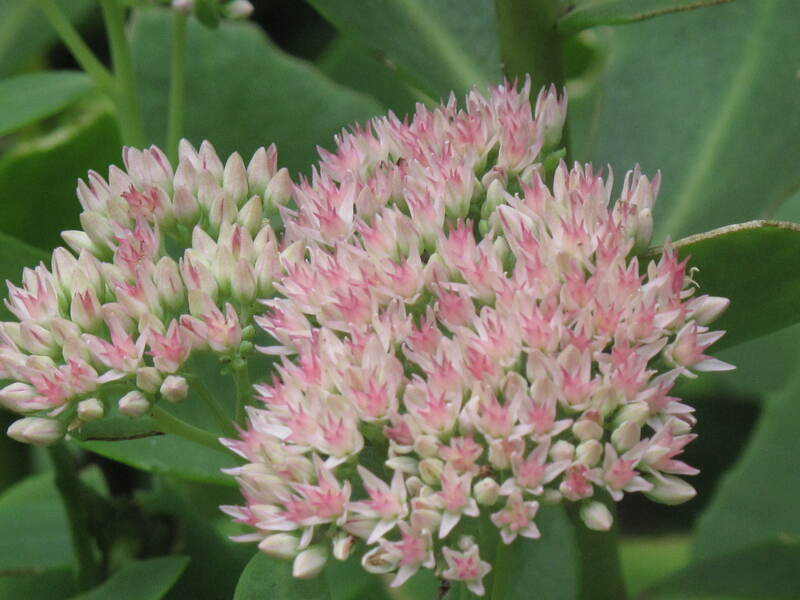 The plant grows through Spring and Summer in our garden, but it is Autumn where the Sedum changes color from green to pinkish red. It is my first wake up call that most things in our garden are now in their final stages and our appreciation of all things green is rapidly coming to a close with Winter only a few months away. Autumn starts a new season of flowers and blooms, second in spectacle only to Spring. Sedum ‘Autumn Joy’ stalks appear in Spring and its flower heads form in July. The flat corymbs that it produces look like broccoli until they change color. In September on Glen Road, the flowers start to color up, turning a pinkish red. 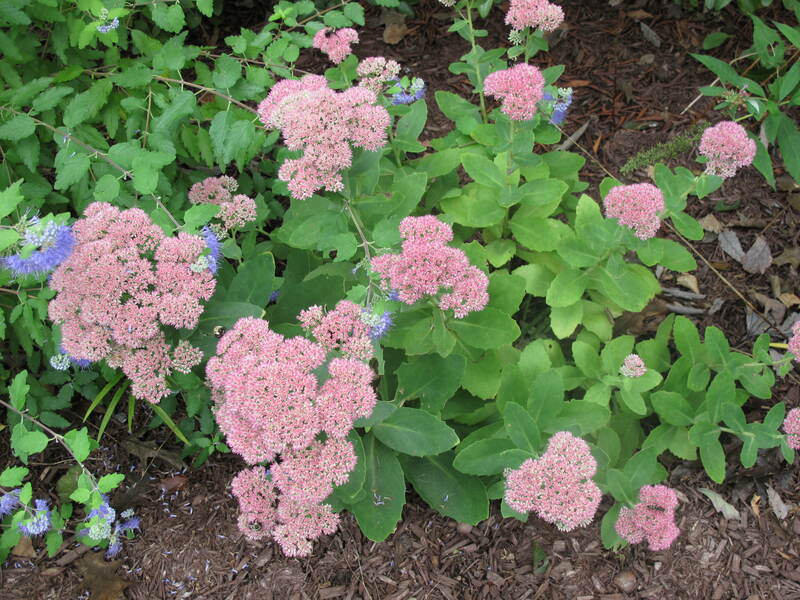 Slowly the flowers turn red, and late in Autumn, the flowers on the Sedum ‘Autumn Joy’ turn a deeper rusty-red. When frost finally takes the final life out of the Sedum, we cut it completely to the ground and say goodbye until the coming Spring. I have read that many people do not cut the spent blooms away at frost time because of its great Winter appeal against the back drop of white snow. 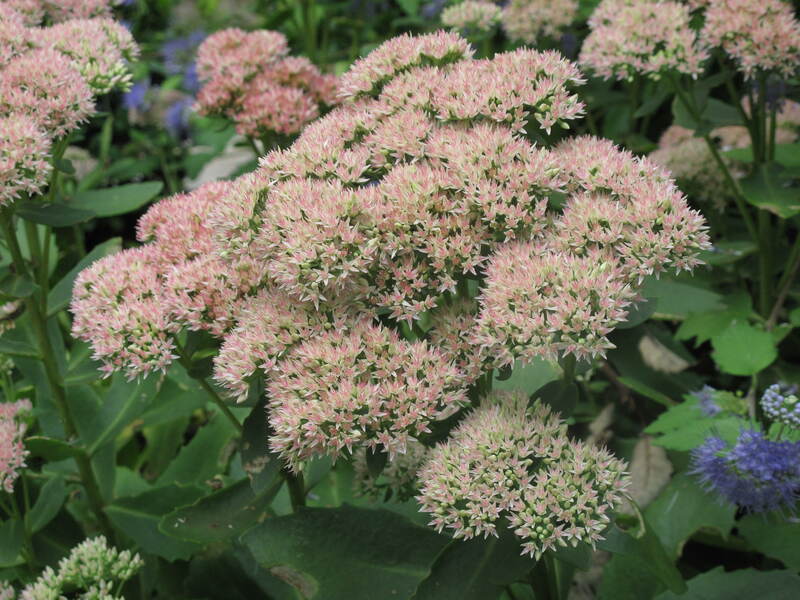 Th Sedum ‘Autumn Joy’ is an excellent plant for those places you just don’t water often. 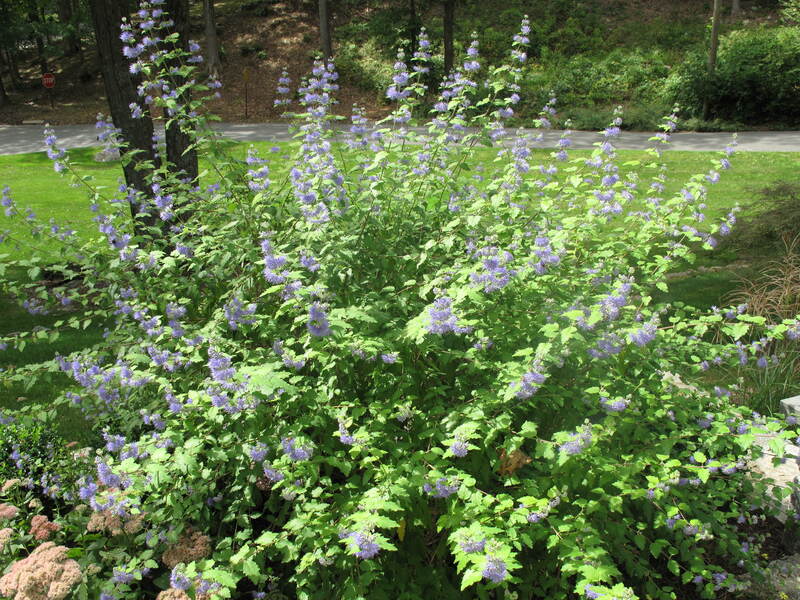 It is very drought tolerant and will turn a lighter shade of color if given too much water. Plant where the Sedum ‘Autumn Joy’ will see a lot of sunshine as the leaves can actually turn floppy with too much shade. 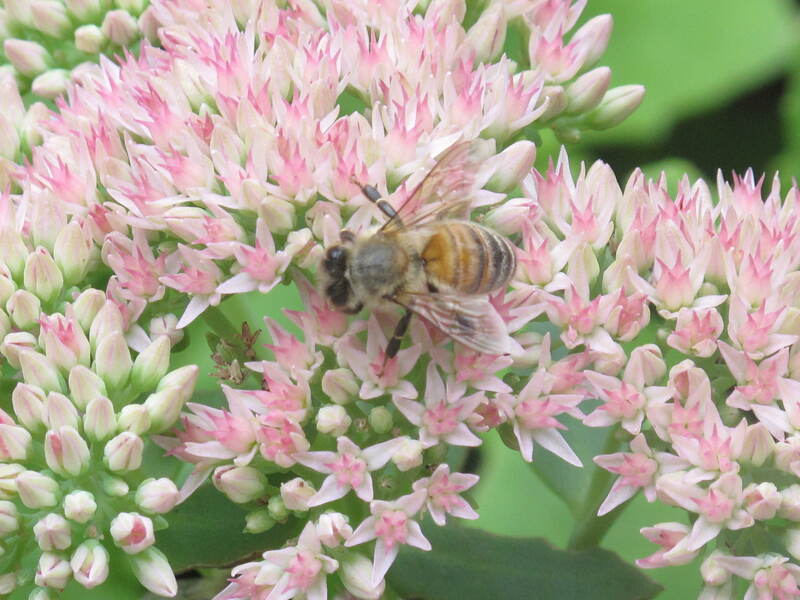 The coloring to pinkish red on the Sedum ‘Autumn Joy’ is always a wake up call to begin Autumn chores. When I see it change color, I think about getting Winter clothes out of storage, making sure the rakes can be found for leaf clean up and scheduling out our garden clean-up dates on my calendar. From a gardener perspective, it makes me sad in a way to know that the garden will be leaving us for a while, but at the same time, this break is appreciated after a long season of planting and weeding. As much as it reminds me that the garden is going to go away to re-energize for another season, it also reminds me of the fact that I too need this re-energizing period of time before I begin to think about my garden in 2012. What things happen where you live that signal that Autumn is here? This is fresh, hot corn bread being cut into six generous wedges for serving. Corn bread seems to be a very sensitive topic for people in the South. When we were on vacation, I saw more than a couple of restaurants that made claims to serving the best corn bread in Charleston. One claim I saw said it was the best due to the use of white corn meal. Another claim said that they had the best because they used local stone-ground yellow corn meal. I didn’t know there were so many choices available in the art of corn bread making as I usually enjoyed the one and only Jiffy-boxed corn bread as a child and have rarely eaten corn bread as an adult. Now that we are back in Connecticut and still cooking a lot of Southern classics, I decided to look around and determine what I would consider the best corn bread recipe on the market. 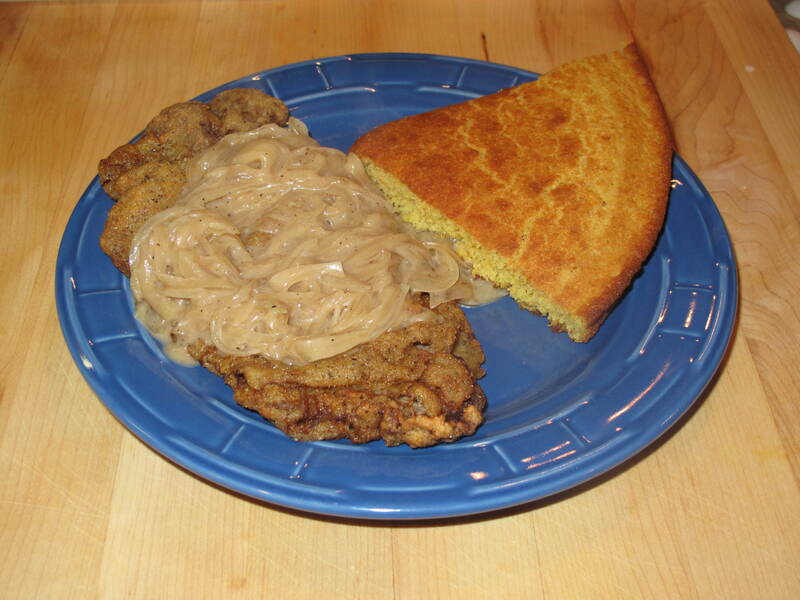 Here is the first contender, again from the ‘Lee Bros. Southern Cookbook‘. Since they haven’t steered us wrong since our return, I figured I’d give their recipe the first shot. What interested me in this recipe was the title, Crispy Corn Bread. I was envisioning a soft center and a crispy and chewy crust on top and that is just what we got. 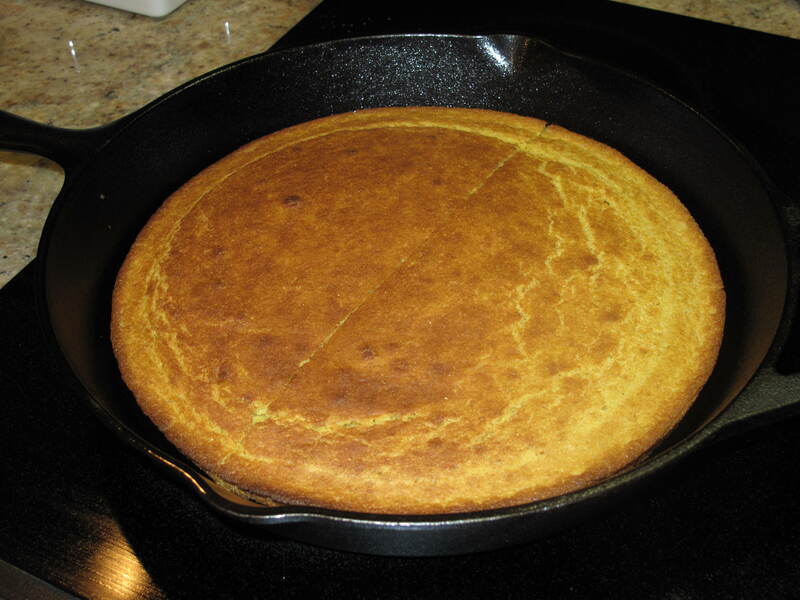 To achieve this crispy corn bread, all I needed was a 12 versus a 9 inch cast iron skillet. The larger skillet is the trick to obtaining corn bread that has that delicious corn flavor and carmelized crust, but because the batter lies thinner in the pan and only gets up to about a half-inch thick, you double the crispiness of the bread while retaining its moistness. Because the crust-to-crumb ratio is very high, this corn bread is like a moist flatbread with a big corn taste. Preheat the oven to 450 degrees. 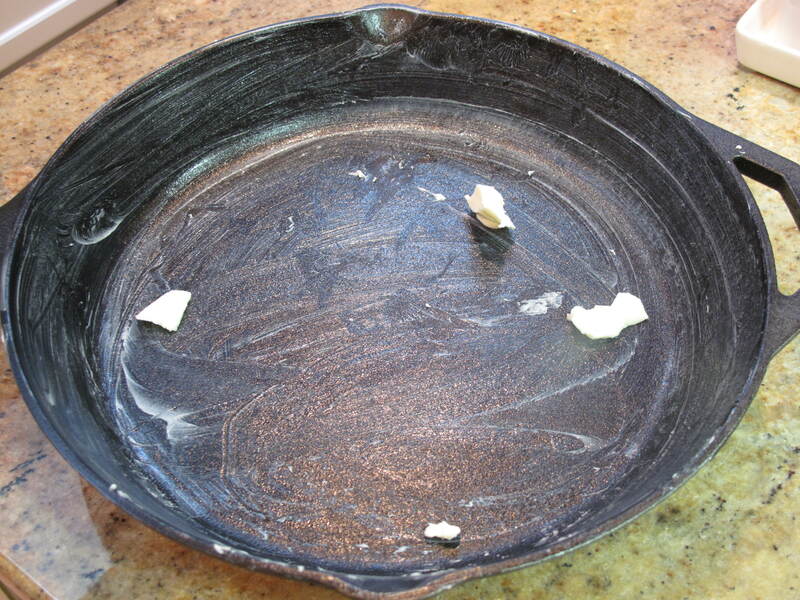 Grease a 12-inch skillet with the butter, leaving any excess in the pan, and place it in the oven. In a large bowl, sift the dry ingredients together. In a medium bowl, whisk the egg until frothy and then whisk in the buttermilk. Add the wet ingredients to the dry ones and mix thoroughly. Melt the butter in a small pan over low heat and whisk the butter into the batter. When the butter in the large skillet is smoking, carefully remove the skillet from the oven and swirl around the butter to coat the bottom and sides evenly. Pour the batter into the skillet. It should sizzle. Bake for 15 minutes, or until the top of the bread is golden brown and the edge has pulled away from the side of the skillet. Remove from the oven. Cut the cornbread into 6 wedges in the skillet and serve hot, with the butter, honey or any other spread of your liking. This corn bread was very good served in a big wedge beside our chicken-fried steak with vidalia cream gravy. This was some good Southern eating. Are you getting the point that I am in love with the Lee Bros. cookbook? So far, no disappointments and some great food. I’m giving this corn bread a score of 8 because I thought it needed to be a little sweeter (again, this is why I increased the sugar content in the recipe above). Give this quick and easy corn bread recipe a try and enjoy the crispy crust the next time you are cooking up your favorite Southern dish. Do you have any tricks for making good, old-fashioned corn bread? This is some more good Southern eating. If you couldn’t tell, we have remained Southern ever since our return from our Charleston, South Carolina vacation. We have continued to research and read about the South Carolina low country and cook from our Southern cookbooks. Did you notice that I said cookbook(s)? Yes, we started with one and are now up to three Southern cookbooks. With the kind of food we’ve been eating, what could be bad with more cookbooks? Our latest dish was Chicken-Fried Steak With Vidalia Cream Gravy. The pros of the dish: it was delicious with a crispy, fried batter covering a thin layer of steak and was seasoned perfectly thanks to a special dredge that utilizes corn meal, flour, bread crumbs and salt and pepper. 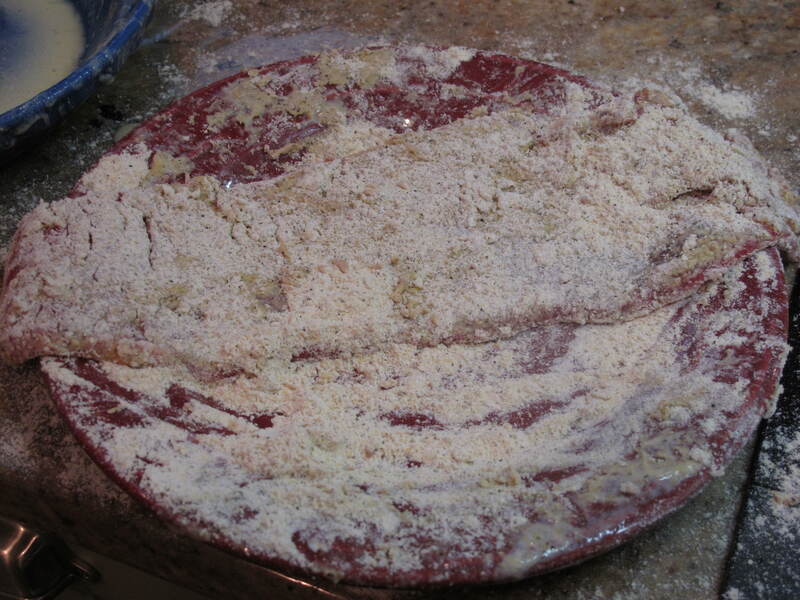 The cons: it is a little messy to make because any time you have to dredge steak through a corn meal coating, egg and buttermilk and then more corn meal coating, you are going to have some mess. The other con: not all people are comfortable frying in front of a big pan of super hot oil. If you can get over these two cons, then you will be in for some delicious Southern comfort food that was a big hit at our dinner table the other night. Again, this recipe comes from the favorite of our new Southern cookbooks, ‘The Lee Bros. Southern Cookbook’. Chicken fried steak is a great example of where leaner, tougher and cheaper cuts of beef actually perform better than the fattier, tenderer rib eyes and strips. The steak cooks really fast in the heated oil. 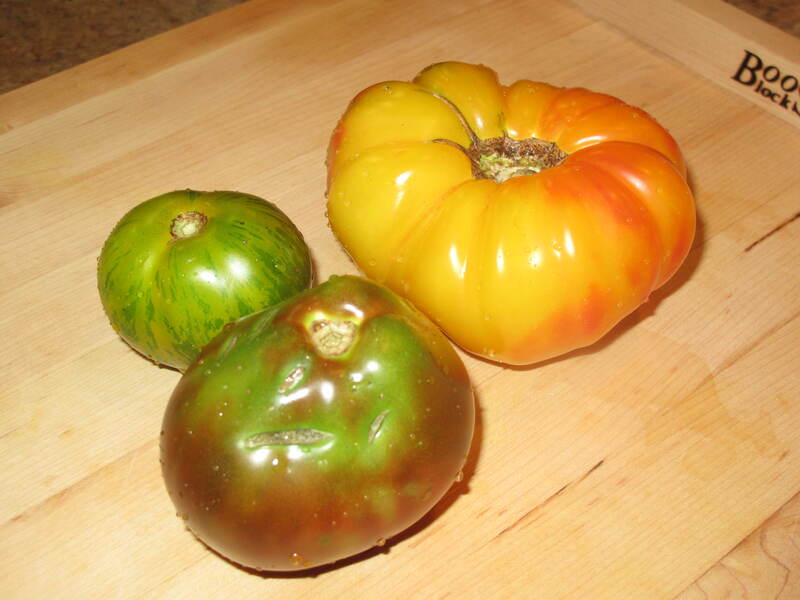 I started our dinner with some slices of super fresh heirloom tomatoes and mozzarella cheese drizzled with a balsamic vinaigrette and some sea salt. A big slab of cornbread was right beside the chicken fried steak and gravy. Dessert was the remainder of our red velvet cake from the other day, since it kept very well in the refrigerator. This meal made us proud to be Southern (ok, I know we are not, but I thought I’d slip that in). A couple of notes: this is a double batch from the original recipe in the cookbook. I found that I needed more dredge than originally specified. Also, it is important to find stone-ground cornmeal, which is much lighter and less coarse in consistency than non stone-ground. 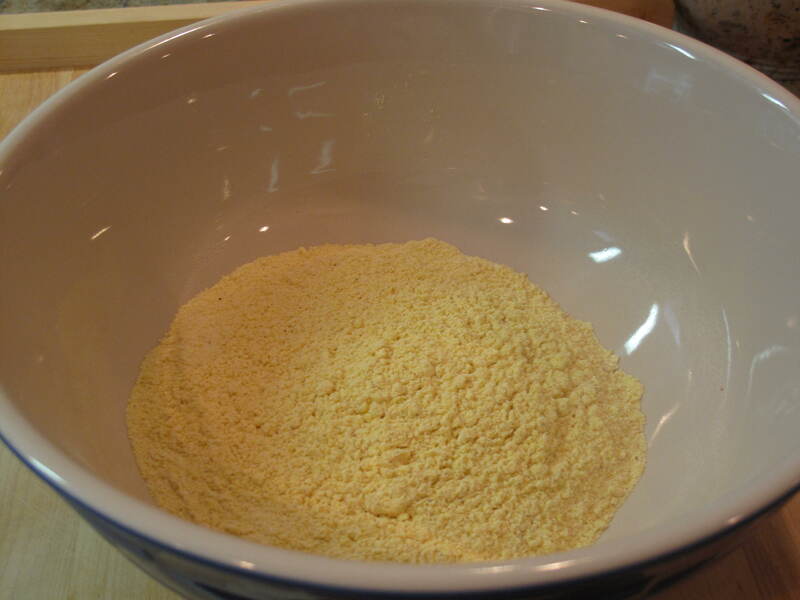 In a medium bowl, sift the flour, cornmeal, salt and pepper together twice. Stir in the bread crumbs and turn out onto a flat surface and dredge according to recipe instructions making sure to shake off any excess. Preheat oven to 200 degrees. Place an ovenproof platter on the top rack. In a 12-inch skillet or saute pan with a candy thermometer clipped to it, place enough peanut oil into the pan to fill it to half way and heat the oil over medium-high heat to 350 degrees. 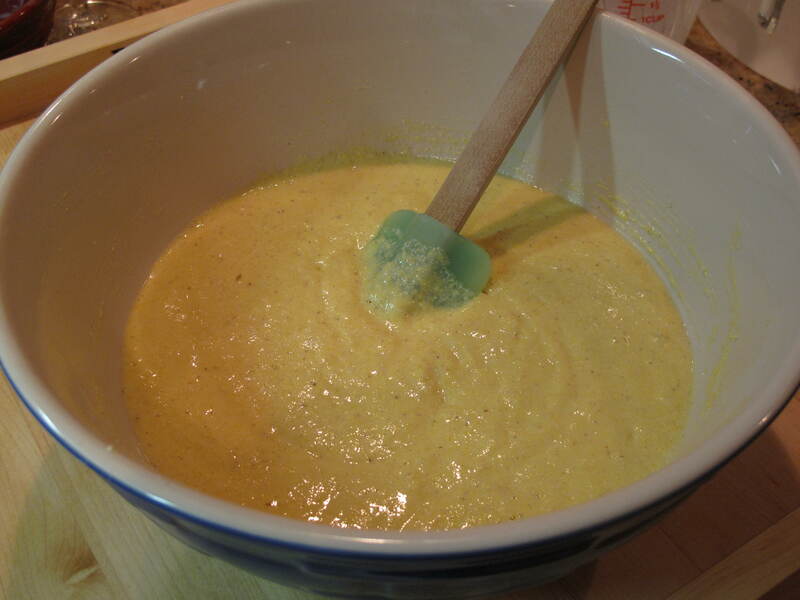 Whisk the egg with the buttermilk and pour into a shallow bowl. Place the fry dredge on a wide plate. Working with 1 steak at a time, envelop the steak in a single sheet of plastic wrap and pound several times with a mallet to tenderize. Coat the steak in the dredge and shake off any excess. Dip in the egg wash to coat both sides. Allow the excess to drip off and then coat again in the dredge. Shake off the excess and place the steak immediately into the hot oil. 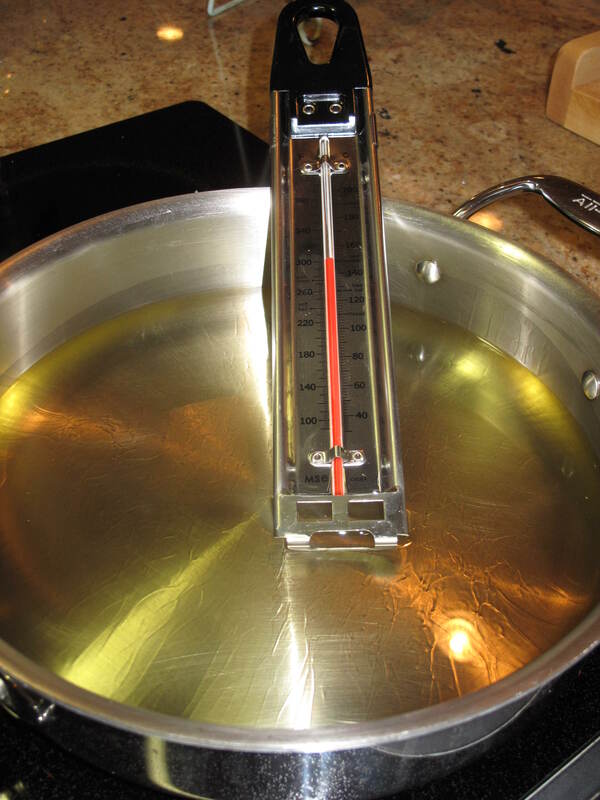 Fry, checking the temperature of the oil and adjusting the heat as necessary to maintain the temperature at 350 degrees, until golden brown, about 2 minutes per side. Transfer to a plate lined with paper towels to drain off any excess oil and then transfer to the platter in the oven. Repeat with each steak. When all the steaks have been fried and are warming in the oven, discard the used oil in the skillet and return the skillet to the burner. 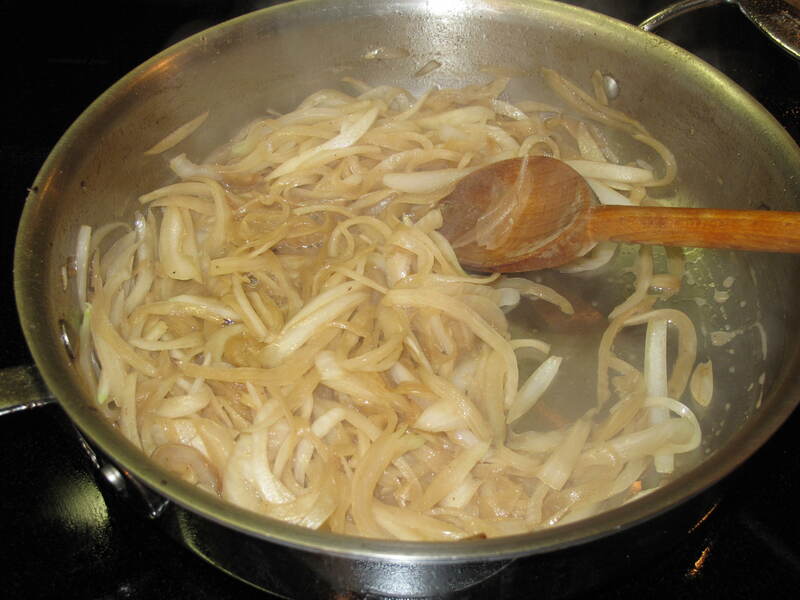 Add the onion, the butter and a pinch of salt and saute over medium-high heat until the onion is soft and translucent, about 4 minutes. In a small bowl, vigorously whisk the flour into the broth until no lumps are left. Pour the broth and the milk into the skillet and add the pepper. 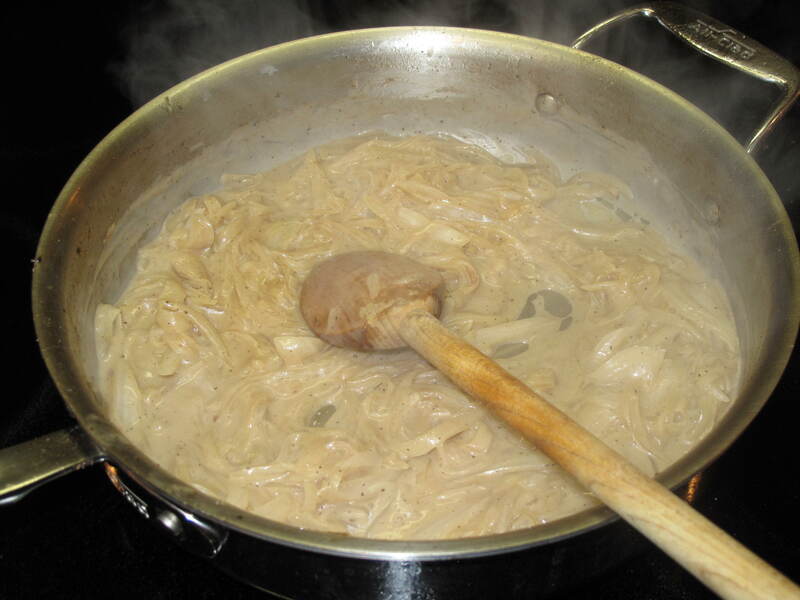 Bring to a simmer and simmer gently, stirring, until the gravy has thickened to the consistency of melted ice cream. Season to taste with salt and pepper. To serve, place the steaks on a dinner plate and ladle a generous amount of gravy over each. Whoever came up with putting the crispy part of fried chicken onto a steak should be considered a genius. The mellow cream gravy with the onions combined with the well-seasoned coating and the steak made for a delicious main course. So we figure if we continue cooking like this for at least another week, we should get our honorary Southern citizenship papers or at least be allowed to speak with a slight Southern accent. 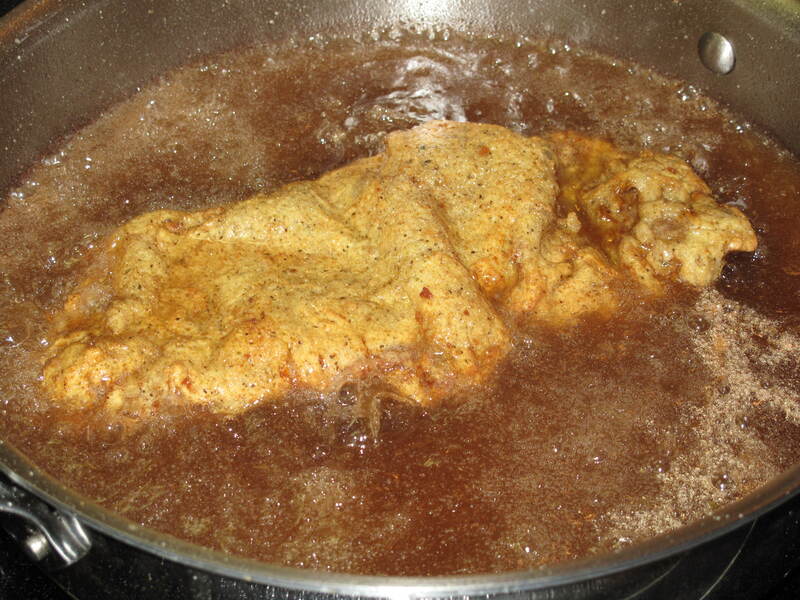 Change it up for your family and try this chicken fried steak and gravy recipe. It is a delicious change of pace. Have any of your vacations inspired you to change it up in your kitchen? I’ve decided that the chorus to this week’s song by Cobra Starship is how I’m going to start talking to people when I feel I am having a problem with them either at work or in a personal relationship. Think about it, if every time you thought you had an issue with someone, you just brought them in and said “You make me feel so _____” and then “You make me feel that _____”, then wouldn’t the world would be a much happier place? I’m the type of person that really bottles up my feelings when I am having a problem with someone. Instead of clearing the air, I’ll walk around for days and not say a word or, at the very least, not say a word about how I’m really feeling. This type of behavior usually manifests itself in an explosion of angry feelings directed toward the person weeks later when they do something unrelated to why I was having problems with them in the first place. Not such a great plan from a relationship management perspective. In fact, I’ve even caught myself writing somebody off for good for doing something to me versus sitting down and talking it out with them. My new Cobra Starship method for issue resolution is going to change all that…starting now. As you are dancing this week and celebrating another week of living, call someone over if you are having an issue with them and try our new technique. Just hope that they don’t answer you back with “la la la la la” like in the song. Have a great dance–you deserve it! How are you at relationship management? Our Charleston, South Carolina Vacation Review Begins!